Turn Detroit into Drone Valley? Establish a favorable business environment and regulations. Except … this approach to innovation clusters hasn’t really worked. Some have even dismissed these government-driven efforts as “modern-day snake oil.” Yet policymakers are always searching for the next Silicon Valley because of the critical link between tech innovation, economic growth and social opportunity. Privately-held companies are - no surprise here - privately held. This means that, in most cases, the company is owned by the company's founders, management or a group of private investors. A public company, on the other hand, is a company that has sold a portion of itself to the public via an initial public offering of some of its stock, meaning shareholders have claim to part of the company's assets and profits. One of the biggest differences between the two types of companies deals with public disclosure. If it's a public U.S. company, which means it is trading on a U.S. stock exchange, it is typically required to file quarterly earnings reports (among other things) with the Securities and Exchange Commission(SEC). This information is also made available to shareholders and the public. Private companies, however, are not required to disclose their financial information to anyone since they do not trade stock on a stock exchange. The main advantage public companies have is their ability to tap the financial markets by selling stock (equity) orbonds (debt) to raise capital (i.e. cash) for expansion and projects. The main advantage to private companies is that management doesn't have to answer to stockholders and isn't required to file disclosure statements with the SEC. However, a private company can't dip into the public capital markets and must therefore turn to private funding, which can boost the cost of capital and may limit expansion. It has been said often that private companies seek to minimize the tax bite, while public companies seek to increase profits for shareholders. The popular misconception is that privately-held companies are small and of little interest. In fact, there are many big-name companies that are also privately held - check out the Forbes.com list of the largest private companies in 2006. "I began with a straightforward research problematic," he says in elegant French-accented English. "I began to wonder a few years ago where was the hard data behind all the theories about inequality, from Marx to David Ricardo (the 19th-century English economist and advocate of free trade) and more contemporary thinkers. I started with Britain and America and I discovered that there wasn't much at all. And then I discovered that the data that did exist contradicted nearly all of the theories including Marx and Ricardo. And then I started to look at other countries and I saw a pattern beginning to emerge, which is that capital, and the money that it produces, accumulates faster than growth in capital societies. And this pattern, which we last saw in the 19th century, has become even more predominant since the 1980s when controls on capital were lifted in many rich countries." "I did deliberately aim the book at the general reader," says Piketty as we begin our conversation, "and although it is obviously a book which can be read by specialists too, I wanted the information here to be made clear to everyone who wants to read it.' And indeed it has to said thatCapital in the Twenty-First Century is surprisingly readable. It is packed with anecdotes and literary references that illuminate the narrative. It also helps that it is fluently translated by Arthur Goldhammer, a literary stylist who has tackled the work of the likes of Albert Camus. But even so, as I note that Piketty's bookshelves are lined with such headache-inducing titles as The Principles of Microeconomics and The Political Influence of Keynesianism, simple folk like me still need some help here. So I asked him the most obvious question I could: what is the big idea behind this book? "Well actually, we didn't know this, although we might have guessed at it," says Piketty, warming to his theme. "For one thing this is the first time we have accumulated the data which proves that this is the case. Second, although I am not a politician, it is obvious that this movement, which is speeding up, will have political implications – we will all be poorer in the future in every way and that creates crisis. I have proved that under the present circumstances capitalism simply cannot work." But no matter. What have we learned? Capitalism is bad. Hooray! What's the answer? Socialism? Hope so. "It is not quite so simple," he says, disappointing this former teenage Marxist. "What I argue for is a progressive tax, a global tax, based on the taxation of private property. This is the only civilised solution. The other solutions are, I think, much more barbaric – by that I mean the oligarch system of Russia, which I don't believe in, and inflation, which is really just a tax on the poor." He explains that oligarchy, particularly in the present Russian model, is quite simply the rule of the very rich over the majority. This is both tyrannical and not much more than a form of gangsterism. He adds that the very rich are not usually hurt by inflation – their wealth increases anyway – but the poor suffer worst of all with a rising cost of living. A progressive tax on wealth is the only sane solution. When I began, simply collecting data, I was genuinely surprised by what I found, which was that inequality is growing so fast and that capitalism cannot apparently solve it. Many economists begin the other way around, by asking questions about poverty, but I wanted to understand how wealth, or super-wealth, is working to increase the inequality gap. And what I found, as I said before, is that the speed at which the inequality gap is growing is getting faster and faster. You have to ask what does this mean for ordinary people, who are not billionaires and who will never will be billionaires. Well, I think it means a deterioration in the first instance of the economic wellbeing of the collective, in other words the degradation of the public sector. You only have to look at what Obama's administration wants to do – which is to erode inequality in healthcare and so on – and how difficult it is to achieve that, to understand how important this is. There is a fundamentalist belief by capitalists that capital will save the world, and it just isn't so. Not because of what Marx said about the contradictions of capitalism, because, as I discovered, capital is an end in itself and no more." His book is indeed long and complicated but anyone who lives in the capitalist world, which is all of us, can understand the arguments he makes about the way it works. One of the most penetrating of these is what he has to say about the rise of managers, or "super-managers", who do not produce wealth but who derive a salary from it. This, he argues, is effectively a form of theft – but this is not the worst crime of the super-managers. Most damaging is the way that they have set themselves in competition with the billionaires whose wealth, accelerating beyond the economy, is always going to be out of reach. This creates a permanent game of catch-up, whose victims are the "losers", that is to say ordinary people who do not aspire to such status or riches but must be despised nonetheless by the chief executives, vice-presidents and other wolves of Wall Street. In this section, Piketty effectively rips apart one of the great lies of the 21st century – that super-managers deserve their money because, like footballers, they have specialized skills which belong to an almost superhuman elite. "One of the great divisive forces at work today," he says, "is what I call meritocratic extremism. This is the conflict between billionaires, whose income comes from property and assets, such as a Saudi prince, and super-managers. Neither of these categories makes or produces anything but their wealth, which is really a super-wealth that has broken away from the everyday reality of the market, which determines how most ordinary people live. Worse still, they are competing with each other to increase their wealth, and the worst of all case scenarios is how super-managers, whose income is based effectively on greed, keep driving up their salaries regardless of the reality of the market. This is what happened to the banks in 2008, for example." The Brain Drain has robbed the world of it's immune system, allowing the cancer of corruption through 'capitalism' to infect the world. Things are about to change. These guys are wrong, but if you can identify their blind-spots, you win. Entrepreneurship drives the success of business, education, nonprofits and government. This begs the question, can someone learn to be an entrepreneur and if they can, what is it that they need to learn and how do they start? In this one hour discussion, Professor Tom Byers and his special guest, Chi-Hua Chien, investor at Kleiner Perkins Caufield and named one of the Top VCs Under 35 by VC Journal, will draw on their wealth of experience with Silicon Valley ventures and entrepreneurs and share the secrets of entrepreneurial thinking. The Stanford Innovation and Entrepreneurship Certificate program. The illusion of otherness is keeping us from reaching our potential. We are one with the universe. Independence and individualism is the foundation of consciousness, but to transcend the self is enlightenment. Infinite growth in a finite world consumes the resources of survival, creating scarcity and injustice. The systems are falling apart. Everything is significant. End the illusion of separation, join the flow. We control our future. We have free-will. Serve yourself, but define yourself correctly as part of the greater universe, and you will transcend the illusions. Jugaad is practiced by almost all Indians in their daily lives to make the most of what they have. Jugaad applications include finding new uses for everyday objects—Indian kitchens are replete with empty Coke or Pepsi bottles reused as ad-hoc containers for dried legumes or condiments—or inventing new utilitarian tools using everyday objects, like amakeshift truck cobbled together with a diesel engine slapped onto a cart (interestingly, the origin of the word jugaad, in Punjabi, literally describes such makeshift vehicles). The word jugaad is also applied to any use of an ingenious way to ‘‘game the system.’’ For instance, millions of cellphone users in India rely on ‘‘missed calls’’ to communicate messages to each other using a prearranged protocol between the caller and receiver: think of this as free textless text messaging. For example, your carpooling partner may give you a ‘‘missed call’’ in the morning indicating he has just left his house and is on his way to pick you up.5 Hence, theword jugaad carries a slightly negative connotation for some. 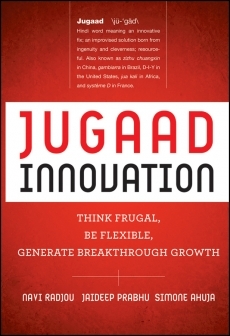 But by and large, the entrepreneurial spirit of jugaad is practiced by millions in India simply to improvise clever—and completely legitimate—solutions to everyday problems. In this book, we delve into the frugal and flexible mindset of thousands of ingenious entrepreneurs and enterprises practicing jugaad to creatively address critical socioeconomic issues in their communities. Jugaad innovators like Mansukh Prajapati view severe constraints, such as a lack of electricity, not as a debilitating challenge but as an opportunity to innovate and overcome these very constraints. Wagemark is a new international wage standard used by companies, non-profit organizations, and government agencies to certify that the ratio between their highest and lowest earners is competitive and sustainable. Organizations choose to become Wagemark-certified to demonstrate their commitment to paying competitive, responsible and sustainable wages. The Wagemark Standard builds on an important and growing body of research concerning the economic and social costs of income inequality and makes it possible for organizations to respond constructively by committing to operate within a wage range that supports greater competitiveness, workplace morale and social equity. Wagemark compliance is certified by the applicant’s preferred chartered accountant or auditor, and does not require the disclosure of either maximum or minimum earnings — only the wage ratio between the top and bottom decile of earnings within an organization. Wagemark-certified organizations are committed to ensuring that the wage ratio between the highest earner and lowest decile of earners within their organization does not exceed 8:1. Wagemark Foundation is about establishing a new moral standard for companies and organizations that want to see a better world and are prepared to put their money where their mouth is. The Wagemark Standard is based on a formula for calculating the ratio between top and bottom earners within an organization. This formula is calculated and certified by a third-party chartered accountant, and compares the total earnings of the highest paid employee with the average pay of the bottom decile of earners within an organization. This decile is based on the proportion of full time and part-time employees within the organization. Earnings include all tax-reported income and benefits. Wagemark-certified organizations must achieve an 8:1 or better wage ratio.